For the sixth consecutive year, Apple has earned the top ranking in Fortune's annual polling of corporate admiration among executives, topping competitors such as Google and Amazon not only in terms of performance, but also innovation. The financial magazine published its "Most Admired" list on Thursday, showing Apple edging out second place Google in terms of corporate esteem. 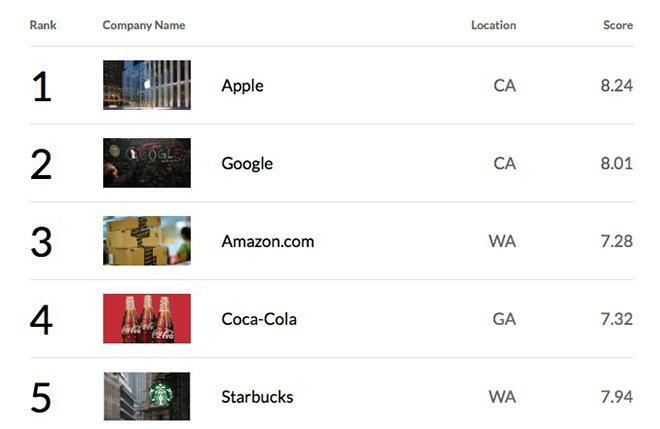 Amazon ranks third on the list, and IBM is the only other technology company in the top 10. In taking first place, Apple beat out other non-tech firms such as Coca-Cola, Starbucks, and Warren Buffett-helmed Berkshire Hathaway. The writeup on Apple for the list notes the company's recent share price troubles but praises its continually solid revenue performance. Apple's products, the piece reads, continue to be seen as prestige devices. "Competition may be stiff," the writeup notes, "but so far it remains behind." Fortune creates the list with 1,400 companies plus 400 more from around the world with revenue in excess of $10 billion. Fortune then surveys 3,800 directors and executives, asking them to compile a list of the top 10 in their sectors from a list made up of last year's winners and this year's sector winners.